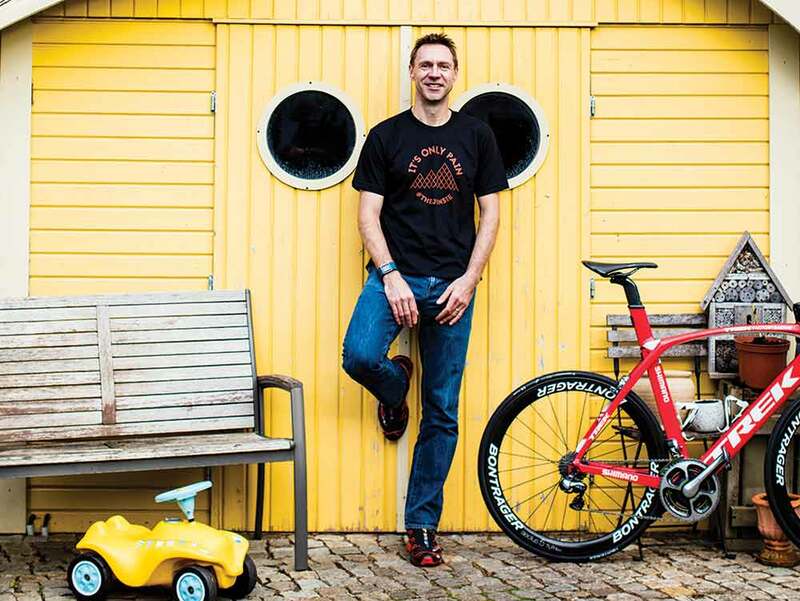 Three years after calling it quits, Jens Voigt is busier than ever as he and other retired riders try to win at retirement. Jens Voigt cannot sit still. It’s almost twilight, several hours after the finish of the 2017 Amgen Tour of California’s fourth stage, and Voigt is seated on a patio outside of the race’s hotel headquarters. Every few seconds his phone buzzes to life. Every few minutes another VIP stops by for a handshake. Phil Liggett and Paul Sherwen are first, and then an executive with the race invites Voigt out for beers. This attention follows Voigt wherever he goes. It’s been three years since Voigt last pinned on a WorldTour race number, yet at 45, he remains one of the most recognizable and, let’s just say it, famous people in all of pro cycling. Some of Voigt’s celebrity is due to lingering memories of those daring breakaways that punctuated his 18-year career. Yet much of Voigt’s contemporary fame springs from his newfound professional life in retirement. 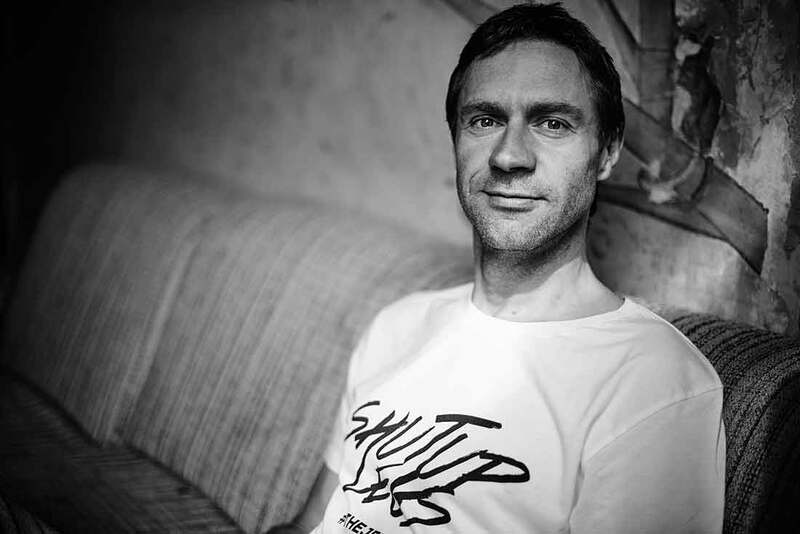 These days Jens Voigt is a one-man media machine, and a human billboard with a TV audience, 250,000 Twitter followers, and 300,000 Facebook friends. His staccato German accent provides color commentary for NBC Sports’s coverage of the Tour de France and the Tour of California. His personal slogan, “Shut Up Legs,” is still scrawled across roadways from Pasadena to the Pyrenees. Voigt is the living, pedaling embodiment of infamous buzzwords often repeated by marketers: “authentic,” “influencer,” “organic.” And every day, he transforms this status into a steady paycheck. His visage promotes some of the sport’s must lucrative products — Zwift, Trek, Fitbit. Australia’s Tour Down Under and the Tour of California employ him as an official “race ambassador.” Voigt even fronts a gran fondo just outside of San Francisco. Voigt’s broad portfolio makes him the poster child for the new era of retirement in pro cycling. Every year dozens of professional riders hang up their cleats and embark on a life away from competition. Many struggle to find livelihoods away from the sport. Some riders like Voigt rely on their grassroots fame — not just their racing results — to create lucrative careers in retirement. FOR DECADES, RIDERS HAVE faced few career options after cycling. Grand tour winners and other superstars launch bicycle or clothing brands, or they work in broadcast or media. The peloton’s working-class riders take smaller jobs within the sport as directors, mechanics, or coaches. Others simply find careers outside of the sport. In retirement, all riders face similar challenges: a huge pay cut, a loss of identity, and new responsibilities beyond pedaling a bicycle. Few WorldTour-level riders attend college or university, so they must learn new skills upon exiting the peloton. The stresses can have a major impact on a rider’s life and sense of self-worth. In 2012, two years before he quit, Voigt began to contemplate retirement. At 41, Voigt still loved to race, yet his power numbers had started to drop. He asked fellow riders and friends about the career options that were open to a rider of his status. His palmares was better than average: five overall victories at Criterium International and two Tour stages. Yet Voigt was not a classics winner, and he had never ridden as a GC leader in a grand tour. He was unsure whether he had the popularity to launch a post-racing career in broadcast or brand representation. Voigt did not want to work as a team director or a coach. He knew that he would need to maintain a steady salary after his racing paychecks stopped. Voigt and his wife, Stephanie, have six children, and they live outside of Berlin. Easing into retirement was not a financial option. American fans loved the soundbite. At the Tour of California fans scrawled “Shut Up Legs” in white block letters along the road, while others drew it on signs. Someone created a website called JensVoigtSoundboard.com which played back the famous quote. The slogan matched Voigt’s aggressive, determined riding style. It perfectly defined his love for doomed breakaways, and his overly expressive, pain-filled grimace. And fans’ use of the quote was confirmation of Voigt’s celebrity. He had attained folk-hero status among American fans. He was cool. While Voigt had garnered cult-like status in the United States, his fame in Germany was muted. Voigt was a contemporary of Jan Ulrich, Erik Zabel, and other popular German cyclists who had become embroiled in the Team Telekom doping affair. He has repeatedly denied doping in his career. So as Voigt prepared for life after cycling, he saw an opportunity in the United States. In 2012 he raced on a custom Trek bicycle emblazoned with “Shut Up Legs,” which garnered attention from the U.S. press. In 2014, his final season, he launched his own line of clothing emblazoned with “Shut Up Legs,” and trademarked the phrase. Sales were promising. He chose Colorado’s USA Pro Challenge for his farewell race. And then he began to reach out to American friends in the industry. Did they want him to endorse their products? The feedback he received was universally positive. A RIDER’S OPTIONS IN retirement have shifted in recent years. Riders who command the greatest audience — be it from results, social media following, or some combination of both — can sometimes leverage their following into ambassador roles with major cycling brands. In previous years, these roles were reserved for the peloton’s most successful riders. “If you are selling your image, then your value is based on what you have done on the bike,” Lukka says. In 2016 Phil Gaimon retired at the age of 30 after Cannondale-Drapac declined to bring him back for another season. An author and regular columnist for cycling magazines, Gaimon had created a sizable fan base. Gaimon also cultivated a sizable online following through social media. In previous generations, a rider of Gaimon’s stature — he had won several domestic U.S. races but was predominantly a domestique at the WorldTour level — would have had to look outside the sport for a job. When Gaimon quit he launched a YouTube channel to broadcast his self-produced video series called “Worst Retirement Ever.” He started a gran fondo in Southern California, and then teamed up with fitness app Strava to promote his chase of regional King of the Mountains records. Gaimon’s various projects relied heavily on his media footprint and fan following. The plan worked. Gaimon’s projects brought on a bevvy of personal sponsors; his current lineup includes Cannondale, Castelli, Mavic, and Strava, among others. Gaimon declined to discuss his earnings as a retiree, but said he now earns more than he did as a pro cyclist. Like Gaimon, Ted King forged a similar path when he retired in 2015 from the Cannondale outfit. King’s duties at the WorldTour level were as a domestique rather than a race winner. Yet he developed a sizable following during his four seasons in cycling’s big leagues due to his own promotion. King was one of the peloton’s first riders to maintain a regular presence on Twitter. He wrote a personal blog and a column for cycling magazines, and used both to discuss the strange inner workings of the peloton. In 2013 the New York Times wrote a story about his disqualification from the Tour de France after missing a time cut. During King’s final year in the peloton, he was surprised when cycling brands asked him to stay on as a sponsored rider. It wasn’t King’s results they were interested in, but rather his fan base. 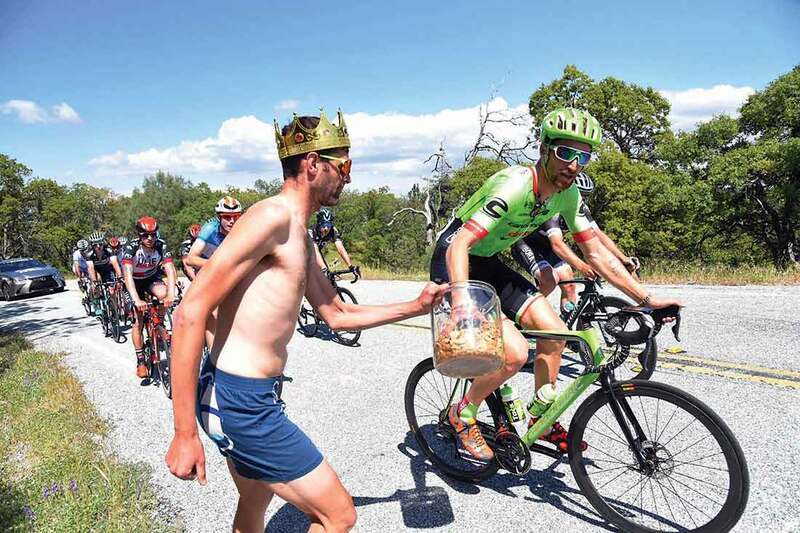 Now, two years after he retired, King travels to cycling events, pop-up rides, and dealer meetings across the country to promote his sponsors, which include Cannondale, SRAM, Zipp, and POC, among others. There are logical explanations behind this phenomenon. Social media now allows fans to connect with their favorite riders, and vice versa. Across the entire sports landscape, savvy athletes now use blogs and Twitter handles to boost their visibility with fans. Brands then piggyback on an athlete’s following to reach potential customers. After all, if fans read an athlete’s tweets, shouldn’t they also believe an athlete’s endorsement? The more visible the athlete, the greater his or her influence. Voigt presents just such an attractive business proposition for brands. In 2015, Voigt’s first year in retirement, producers from NBC Sports contacted him to try out as a broadcaster. Voigt admits he was not a natural on TV. He approached broadcasts as if he were explaining the race action to his mother, he says. He was initially afraid that his thick German accent would be a turnoff to viewers, but NBC producers convinced him otherwise. In early broadcasts, he had to remind himself not to swear. Voigt’s time on television only boosted his promotional power. In 2016 he starred in a series of television commercials for the Tour of California. Brands had pragmatic reasons for working with Voigt. Ryan Bodge, sports marketing manager at Trek bicycles, says current professionals often lack the free time and enthusiasm that a retired professional can bring to a brand. The lifestyle of a retired athlete is also more relatable to potential customers than that of an elite athlete. Fitness tracker Fitbit hired Voigt, in part, because of his life away from pro cycling. Several times a month Voigt writes a blog about his family life and his efforts to stay fit, despite his rigorous travel schedule. WHY DO FANS FOLLOW an athlete? Every year advertising agencies spend billions to create authentic moments similar to Voigt’s “Shut up legs” quote. The simple truth is that authenticity is something that cannot be purchased — it must come from an organic appreciation of a rider, race, or moment. Voigt is hardly the first rider to attract a cult-like following in pro cycling. During King’s eight-year professional career, fans came to associate him with maple syrup, due to his New England roots. King decided to embrace syrup as part of his personal brand, and launched a syrup company, Untapped, in 2015. “When I was getting maple syrup handed to me from fans there was no real intention to start a business there,” King says. “It was totally organic.” Gaimon witnessed a similar dynamic occur after he mentioned his love for cookies in a blog post. Fans brought cookies to Gaimon at his team bus. After several months of cookie-themed social posts, Gaimon’s personal brand became linked to the dessert. Gaimon named his gran fondo after cookies, and now sells bike kits, socks, and hats with a cookie pattern. He even took the brand to the Amgen Tour of California, setting up a tent alongside a steep switchback to promote his cookie-themed race. Of course the promotional challenge posed by cookies, maple syrup, and even catch phrases are whether they can attract fans in the long term. What’s the enduring value of a catch phrase in cycling? Steve Brunner, president of KOM Sports Marketing, believes cycling’s new era has changed the calculus. A decade from now, will fans even remember the cycling careers of Phil Gaimon, Ted King, or Jens Voigt? If not, then fans may still know them for their exploits across social media, or their promotional work with brands. Voigt says he’s up to the challenge, at least until his kids are out of the house. And when brands are no longer willing to pay him to crisscross the globe signing autographs, then he may actually retire.